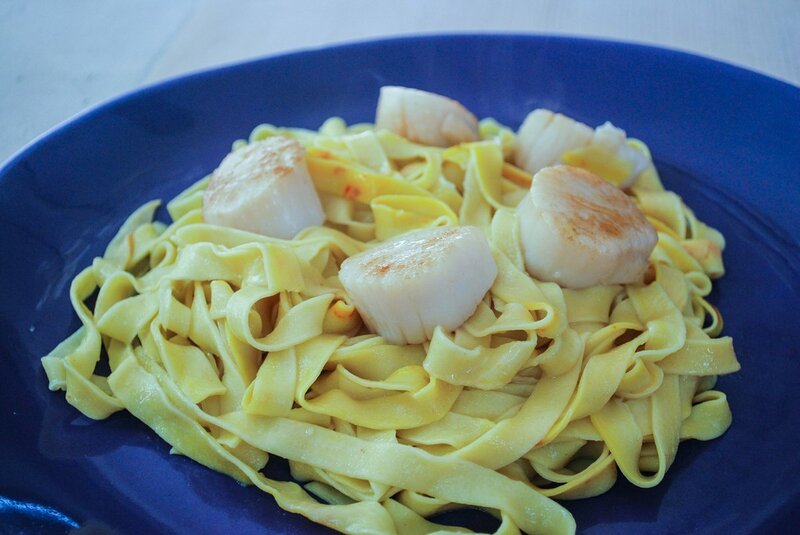 if you are making the pasta with scallops, allow 4-6 scallops per person. Combine the eggs and flour and knead, knead, knead (I throw mine in the kitchen aid with the dough hook) until well-combined. The dough will be crumbly. Meanwhile, “bloom” the saffron by stirring it into the boiling water. Allow to sit for 5 minutes and then mix into the pasta dough (saffron threads and all). Knead, knead, knead until your dough becomes very supple. Marvel at how beautifully yellow it is! Allow the dough to rest, covered with a towel, while you boil a big pot of salted water . Roll out the pasta dough to your desired thickness (I like mine thin), and cut into linguine, fettucine, tagliatelle or whatever you like. Boil the pasta in the salted water (it will only take a minute or two), drain, and toss with the sauce. Think how delicious this pasta will be mid-summer, with fresh tomatoes off the vine, basil from your garden and a swirl of cream. Yum. Toss the pasta in the water (it will cook in mere minutes!) After draining the pasta, toss in a bit of butter. Quickly sauté the scallops in a very hot skillet with olive oil. Season with a bit of salt and lemon. Serve with the pasta in splendor! Melt butter in a skillet over meduim heat, and add the garlic. Really let the garlic impart it gogeous flavor to the butter before you add the mushrooms. Stir in the mushrooms and cook for a few minutes until the mushrooms are tender. Season with salt and pepper and taste. Add just a bit of cream to really feel decadent, and a little swirl of truffle oil (only if you like), to really bring out the mushroom flavor. Follow the instructions for the pasta above, and when cooked, stir in the mushrooms.